LONDON (AP) — It was 50 years ago today — almost — that Sgt. Pepper taught the band to play. 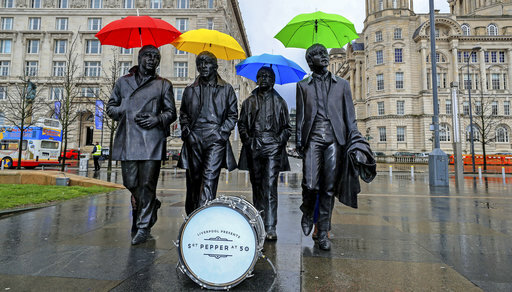 The English city of Liverpool is getting set to celebrate the half-centenary of “Sgt. Pepper’s Lonely Hearts Club Band,” one of the most influential albums by local heroes The Beatles. The works will have their world premieres at venues across Liverpool between May 25 and June 16. On June 1 — the anniversary of the album’s release — the city will host a fireworks extravaganza by French pyrotechnic artist Christophe Berthonneau. By the second half of the 1960s, The Beatles had tired of touring. They played their last live concert in August 1966 and devoted their energies and creativity to the studio. “Sgt. Pepper” was recorded at London’s Abbey Road studios over five month in late 1966 and early 1967, and released on June 1, 1967. Incorporating technological innovation and diverse musical influences — including Indian classical, English music hall and trippy psychedelia — it topped the charts in Britain and the U.S. and was instantly hailed as a rock ‘n’ roll landmark.